This morning I noticed yellow goo next to the tomato plants in my garden. I don't have a clue as to what it is? It almost looked like yellow slime. Do you have any idea what this might be? What you are describing sounds like slime mold. Slime mold is a fungus-like organism that used to be classified as fungi, and later as Myxomycetes. Slime mold typically develops on lawns, small plants, mulch, and decaying wood in late summer. It is not a plant parasite; however, it can injure plants by covering and shading them. A bright yellow (can also show up as other colors – brown, pink, or white), slimy substance is commonly seen in the summer on mulched garden beds. It also forms on mulch around trees and shrubs. The yellow blob will eventually turn gray, becomes hard, and then break down into a brown powdery substance. Rake or turn under affected areas. 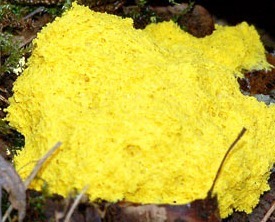 Take a shovel and scoop up the slime mold and affected mulch, place it in a bag, and throw it away in the garbage. broken or washed away with an intense spray from a garden hose. Vinegar can be used in a mild cleaning solution that will kill mold and disinfect the general area. Add equal parts of white vinegar and water to a spray bottle and mix. Spray mixture over the affected area. If wood chips are sprayed, stir the wood chips, and spray an even coating over all of the wood chips. Repeat this process if necessary to prevent mold from returning. Tea tree oil can also be used to kill slime mold without harming vegetation. Add two cups of water and two teaspoons of tea tree oil to a spray bottle and mix. Spray mixture over affected area. Repeat every day, until the slime mold disappears. Spray area every two weeks to prevent mold from returning. Baking soda can also be used to treat and prevent slime mold growth. Sprinkle baking soda over the affected area. If wood chips are involved, dust the wood chips with baking soda, stir, and then sprinkle a second application, making sure that all of the wood chips receive the baking soda application. Repeat this process every day - until all traces of the slime mold is gone. Repeat every one to two weeks to prevent slime mold from returning. Join in and write your own page! It's easy to do. How? Simply click here to return to Gardening Questions.